Music of the Night Mijas is a combination of three previously sold out shows: Encore the Three Tenors, West End Musicals and The Best of Broadway. The show returns one final time this year to Marbella on 1st November! 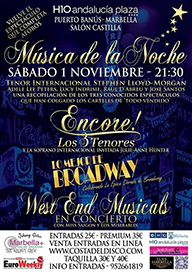 International Tenor Stephen Lloyd-Morgan, Adele Lee Peters, Lucy Indriste, Raul D'Abreu & Jose Santos and the casts from Encore the 3 Tenors, The Best of Broadway, and West End Musicals.